I turn to constitutional scholar ERWIN CHEMERINSKY to talk about legal issues raised by the Trump administration. How far is this Supreme Court going to go in weakening the separation between church and state? Is Trump violating the law by making money – including taxpayer’s money – from his businesses and properties? Who’s going to enforce that law? How bad is it that he belittles and scapegoats the judiciary? Is it too early to think about impeachment? We’ve only got a half hour, but we cover a lot. While we may be disappointed in his apparent lack of civics knowledge, in his own way, he spoke the truth. The most lasting actions a president takes may be his appointments to the Supreme Court. Supreme Court justices serve for as long as they wish or as long as they are able. Their decisions very often set precedents that can live forever. Bush had appointed John Roberts Chief Justice in his first term, but according to today’s guest, it was his second term appointment of Samuel Alito to replace Sandra Day O’Connor that really solidified the Roberts Court. O’Connor had been a much more moderate conservative than Alito has proven to be. The center of the court shifted to the right, which may matter little in decisions with large majorities – more than 50% of cases each term are decided unanimously or by 8-1 or 7-2 votes — but can be crucial in decisions decide 5-4. 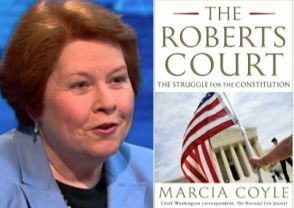 MARCIA COYLE has chosen to focus her book THE ROBERTS COURT: The Struggle for the Constitution on four such 5-4 decisions – Citizens United on campaign finance; District of Columbia v Heller on gun control; on race in school choice; and on the constitutionality of the Affordable Care Act. This will be a conversation about the state of things as we embark on 2012. I will be joined by TOM FRANK (What’s the Matter with Kansas?) and EDGAR CAHN (founder of Legal Services and Time Dollars). We will talk about their passions and projects. In his new book, PITY THE BILLIONAIRE, Frank examines how the crash that has hurt so many millions of Americans has delivered wildly perverse political results. He gives us a diagnosis of the cultural malady that has transformed collapse into profit, reconceived the Founding Fathers as heroes from an Ayn Rand novel, and enlisted the powerless in a fan club for the prosperous. Edgar Cahn was a serial social entrepreneur before the term was invented. In 1974, he and his wife co-founded the Legal Services Program to deliver legal services to the poor, then co-founded Antioch School of Law, where students learned through providing legal services to the poor. Two decades later Cahn created TIme Dollars, a system to bank and exchange services rather than currency. In the larger conversation, I want to take a fairly big picture, historical, and forward-looking perspective. While I assume we will talk about global economics and international conflicts, the emphasis would be on the US. Though I assume we will talk about the fall election, I want to look more broadly. Questions like: Where are we as a society – socially, culturally, economically, and politically? What’s working and why is it working? What are your fears and hopes for the year ahead? What stories and narratives will you be paying attention to in the next year? Maybe something about the battle over the narrative of America’s founding and the American dream. Is there a story in which humanity turns things around? 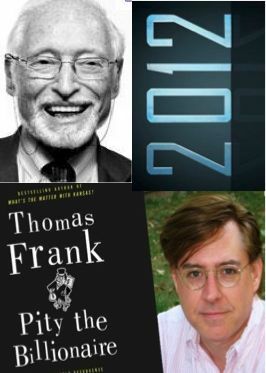 THOMAS FRANK, a former opinion columnist for The Wall Street Journal, is the founding editor of The Baffler and a monthly columnist for Harper’s. He is the author of The Conquest of Cool; What’s the Matter with Kansas? One Market Under God; and his newest, PITY THE BILLIONAIRE. EDGAR CAHN teaches Law and Justice, and directs the Community Service Program at the University of the District of Columbia School of Law. A co-founder with his late wife Jean Camper Cahn of the Antioch School of Law, UDC-DCSL’s predecessor; the first law school in the United States to educate law students primarily through clinical training in legal services to the poor. In the late 1980s, Professor Cahn began the Time Dollars project, a service credit program that now has more than 70 communities in the US, UK and Japan with registered programs (www.timebanks.org). He’s the author of several books, including Hunger USA, Time Dollars and No More Throw-Away People.